We should be seeing a few more interviews from the Mouvement Nouveau folks, as they approached me a few weeks back with an interest in doing a series of in-depth interviews. I'm extremely pleased with the depth and intelligence of the questions (and the answers!) 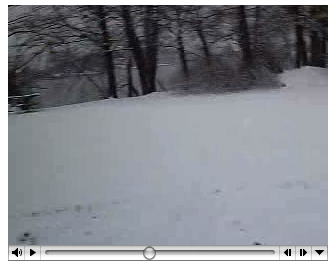 and can't wait for more! Last week, I joined the podcaster's yahoo discussion group in response to questions about the Magnatune podcasters-can-use-Magnatune-music-free license. Two things emerged from a flurry of email discussions that week. Firstly, there were a few modifications to the Magnatune license to allow videobloggers to use our music (specifically, to define an alternate form of crediting the music, which works just for video, ie the "roll the credits" at the end). 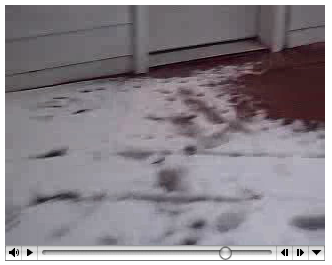 The fruit of that is the first video blog I've seen using our music, and the author was kind enough to email me about it. Video blogs are like normal blogs, documenting a person's life and thoughts, but communicated via video rather than text. Seems perfectly reasonable. Jan says we're only a few years away from the fully-documented-life, where people video tape every moment of the life, and your life will have one long Magnatune background track (insert maniacal laugh here). Which does remind me of a great movie called "The Final Cut" which was barely distributed in the USA, but well worth seeing, about a future where your entire life is documented and turned into a video epitaph. Commercial-but-poor: if your podcast is commercial (as defined above) you can still use our music on your podcast for free, as long as 1) your annual "gross profit" (gross sales minus gross expenses before salaries) is less than $50,000 per year, 2) you give attribution on the podcast to the Magnatune songs as defined below, and 3) a short audio advertisement for Magnatune in your own voice shows up in the podcast, saying something similar to "Some of the songs on this program were provided by Magnatune.com, Magnatune is a really interesting music web site that lets you listen for free, name the price you want to pay, and half their revenue goes directly to the artist. Check out www.magnatune.com"
Response to this was *extremely* positive among the podcasters on the list, and I heard from a few commercial-but-poor podcasts who started using our music. The average price people choose to pay for albums at Magnatune is slowly going down. The chart above shows the past year, with the average price per week having decreased about 40 cents, or 5% in the past year. 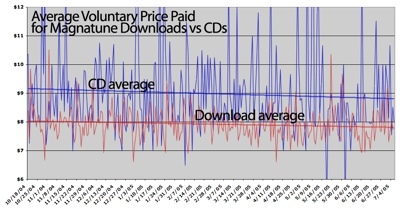 The average voluntary price paid in the past 20 days was $7.78 for downloads, and 8.67 for the music on CDs. Note that people pay an average of $1.09 more for music when they're buying a CD. I'm guessing that this downwards trend is caused by the widening of Magnatune's audience from a core open-source activist audience to a larger mass audience. At least, that's what people have suggested would occur, and it's a plausible answer. I don't see a problem with the lower per-album prices, since the volume of sales is up, and there is increased competition for online music spending, so people are automatically adjusting what they're willing to pay at Magnatune given the current environment. I'll shortly be releasing two podcast show series featuring all Magnatune music. I'll probably also do "new" and "weekly" podcasts of all genres mixed together, for those of you who have wide-ranging tastes. All the podcasts will be around one hour in length. I hope to get the listed on Apple's podcast directory, as well as the other major directories. I'll be making "historical" podcasts going back 2 1/2 years, so you can hear the "what's new" show from 2 years ago, if you want! I know that both Joel and Jan want to make their own podcasts of their favorite music, and if I ever let them have a few hours free, we'll also add those. 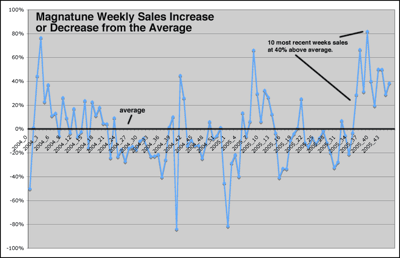 The chart below shows sales for each week relative to average sales per week. You can see that we had a flat 14 months or so, at around 20% below average, finally ending with a bunch of changes to Magnatune at the end of August, causing a 40% increase in sales. On another topic, while CD sales did very well last year before christmas, they've declined since and stabilized at 15% of album sales (ie, 85% of album sales are downloads). CD sales percentage does seem to have increase slightly, around 20%, in the past 10 weeks, at the same time as overall album sales have increased. 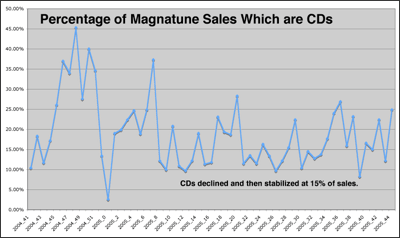 Since we're about to go into the christmas season, we'll soon see if the CD sales increase will repeat this year. On the music licensing side, September was our best month ever, with 37 music licenses issued. October brought things down to 16 licenses, and averaging the months yields a typical month-to-month result.